Looking for a USB Power Delivery charger for your iPhone, iPad, MacBook or Android device for cheap? How about something that costs just $7.99? Keep on reading then. The world is rapidly moving towards USB-C and outlining the proofs at this point would be a waste of time. Every other device supports the protocol now and it’s a great thing as we can top up our devices at a faster rate than before. Remember when 5W charging was a thing? It’s best to forget about it completely. 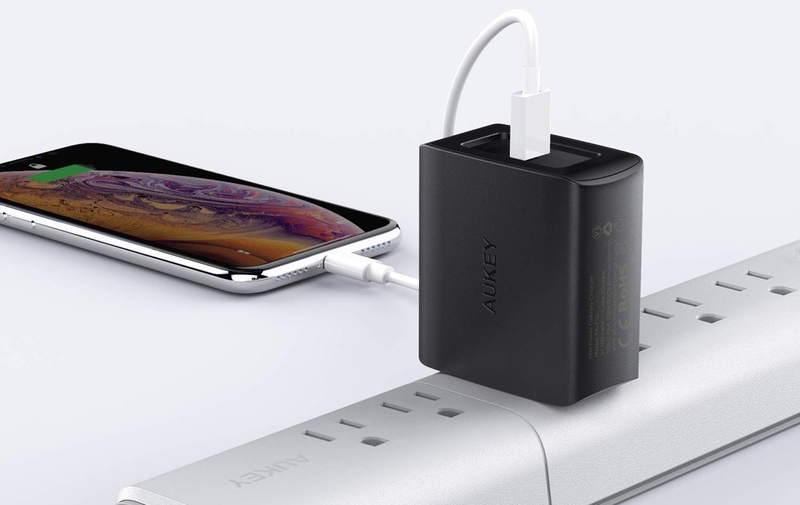 For a limited period of time, AUKEY is offering everyone to pick up one of their 18W chargers for a low price of just $7.99 which otherwise retails for a cool $12. Even without the discount applied, the price seems way too reasonable. But of course, when you start saving some bucks then you realize that you now have the chance to pick up two of these without having to spend too much money. So, what do you get for $7.99? Read up! Since this charger plays nicely with Power Delivery 3.0 therefore it will work with modern devices just fine including the new iPhones. But keep in mind that you have to buy one of those fancy USB-C to Lightning cables from Apple if want the fast charging magic to happen. Gobble up the deal today and fast charge your compatible devices on the double!